Public Eye followed the adventures of Frank Marker, a down at heel Private Eye, based in London, Birmingham, Brighton, Windsor and finally Chertsey. Marker was a man who could be summed up in negatives. He wasn’t rich, he wasn’t exciting, he didn’t get the girls, he wasn’t intended to be dashing, he didn’t have an exciting job and when he did end up in a conflict he invariably came off the worse for it. What Marker was, however, was a great lynch pin around which the characters central to the story would revolve. He was a decent man who lacked luck, he was a loner who ended up making friendships with Mrs Mortimer (Pauline Delaney) and Detective Inspector Percy Firbank (Ray Smith who later went on to play Spikings in Dempsey & Makepeace), these friendships were very much on Markers’s terms only and he did test these sometimes! The series was first produced by ATV and relatively little of this remains in the archive. Thames took over in 1969 and the series moved to Brighton, this series deals with Marker’s time getting his life back on track after serving a prison sentence (Marker of course conned by a client and left to carry the can). The Brighton series also saw the production of the first “Colour” episode, which was never broadcast in that format, but was made to test Thames’ new colour equipment. This was “A Fixed Address”. In 1971 the show moved to Windsor for the fifth series and was the introduction of Percy Firbank. This saw the series move to Colour (Though the 1971 series saw a mix of Colour & B&W). Perhaps the most remarkable Episode of the Windsor shows was “The Man Who Said Sorry”, now baring in mind these episodes were made to fill a 1 Hour slot on the ITV network (about 50 mins plus adverts) it makes it all the more remarkable that this episode, probably the strongest episode of the whole series was for the most part a two hander, based in Marker’s office with Paul Rogers playing the part of the hapless bitter divorcee Clemens. It is not unusual for Marker to take on a case to find himself helping the person he was hired to find, or for Marker to find himself on the receiving end of a crooked client particularly when a crooked solicitor caused him to serve time in prison (Cross That Palm When I Come to It). Indeed in “Lifer” he is hired to find a man’s runaway wife’s lover, only to find the man is Brian Stafford who in fact has just been released from prison for killing Marker’s client’s daughter. Despite what he has done it is difficult not to feel some sympathy for Stafford, who is a completely broken man, tortured by what he has done and haunted by the memory of his victim. 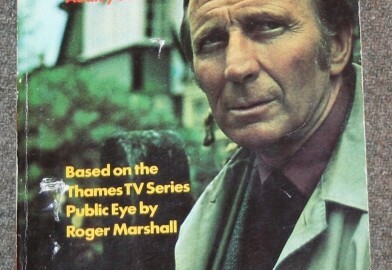 Public Eye ran until 1975. Alfred Burke had decided not to continue as the series was due to be made by Euston Films (of The Sweeney fame) and Burke felt that the faster paced, film shot, more action packed style of Euston would not work with the low key feel of Frank Marker.